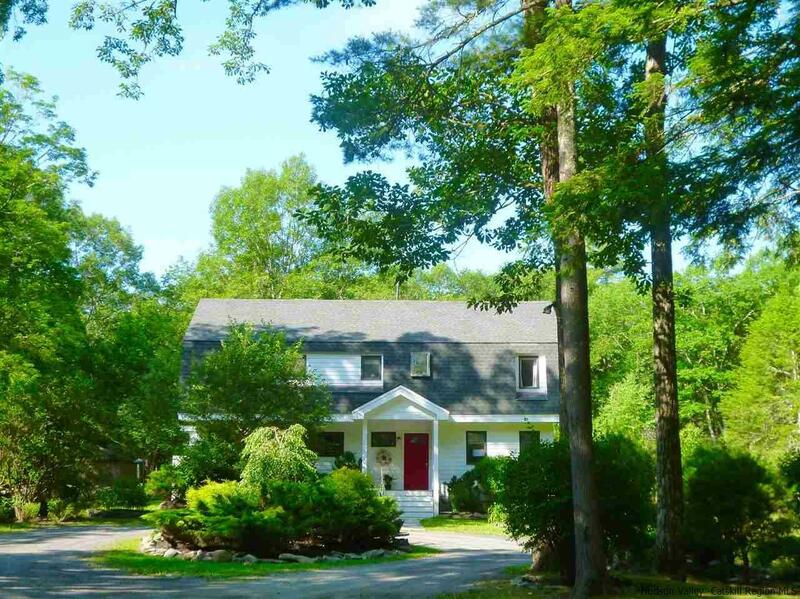 You will have a peaceful, easy feeling once you set foot on the grounds of this beautiful Woodstock property. Although it is located just five minutes from downtown Woodstock, this serene home set on 17 acres of lush woodland will make you feel like you've been transported to a private paradise. An abundance of light and good energy draw you in from the gracious entry toward the dramatic living room, which features cathedral ceilings & several tall windows. A gorgeous stone fireplace with wood stove insert adds additional ambiance. Open flow between the living room, dining area, and kitchen offer the right amount of “togetherness,” yet allow for a bit of separation. The kitchen offers features that will please the most avid home chefs, including polished concrete counters, top-of-the-line appliances, and an airy walk-in pantry. The dining room table is located just a few feet away, keeping guests within easy conversation range. Just beyond the kitchen another large room offers ample additional storage space to meet your specific needs. Enjoy hardwood floors throughout this immaculately kept home, with additional tasteful details around each corner. The first floor bedroom is currently set up as den/office space with a full bath located just across the hall. Upstairs there are two additional bedrooms, including a magnificent en-suite master with windows galore, a whirlpool soaking tub, a steam shower, and a balcony overlooking your lovely garden. On a warm summer day, enjoy the view from your upstairs balcony or large back deck as gentle wildlife gracefully meanders across the property. Just a stone's throw down the driveway, find a large two-car garage with a newly finished guest apartment on the second floor. This spacious one-bedroom apartment will delight guests with plenty of privacy and abundant modern comforts, including a light-filled living room, modern kitchen, full bath, and central A/C! Surrounding the property's primary structures, you will find impeccable landscaping, an herb garden, and a large vegetable garden. Additional buildings include a large red barn and red garden shed located just steps from the main house. Best of all, this property is able to operate almost completely independently from the energy grid! An easy-to-access automatic generator provides backup power if electricity goes out in the area. A working pump in the front yard gives access to clean water, and solar panels have been installed to keep the cost of energy quite low!